Playoffs matter in American sports and the MLS playoffs are showing why. In a country with a packed sports marketplace it is difficult for regular season play to really captivate the country. All the other major professional sports, except for the NFL, similarly rely on the playoffs to serve as their premier national platform. This year’s MLS playoffs thus far have produced exciting, enthralling games and are showing that playoffs can do for MLS what they do for other American sports. It is safe to say, that the playoffs are here to stay. Yet just because these playoffs have produced some great match ups and some great games that doesn’t mean the format is perfect. The fact that a team from the east can potentially play for the western conference title is bizarre. The limited time between the games and the travel involved definitely takes a toll on the players. Not all of these problems have simple solutions. The league obviously wants the best teams in regardless of conference. It also wants to have as long a regular season as possible and is in a race against the weather to get the playoffs in before winter sets in. 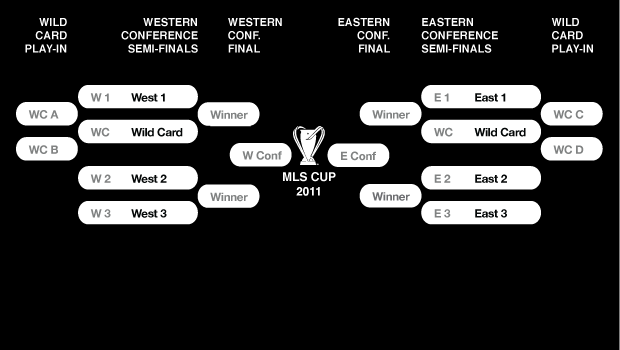 But the main thing MLS should change is the 10 team playoff format. The two mid-week wild card games were unnecessary. Not only was attendance fairly abysmal for these games, but the fact that they are midweek create a lot of travel uncertainties for the non-wild card teams. And since the lower seeded teams host the first game in the home and away series, this creates less time to promote the match up and sell tickets. Yes without them we would have not had the New York-LA match up. But it is hardly an advantage for LA – the #1 seed – to find out on late Wednesday that they have the schlep across the country. I understand one of the motivations for the 10 teams is to keep more teams in the playoff hunt to the very end so as to avoid meaningless end of the season games. But there are couple of things wrong with this. 1. Having 10 teams – or more than half the league are in the playoffs – just means less is riding on each regular season game. If you are among the bottom half of the teams in the league you simply don’t deserve to be playing for the title. 2. The league basically enforces parity, which means that even with 8 teams there will still be a very large basket of teams in the playoff hunt. To be in the top 8 this year required 48 points (both Philadelphia and Colorado would have been the last ones in). Columbus (47), New York (46), Chicago (43), Portland (42) would have all missed out on the playoffs. Yet all four of these teams would still have been in the hunt in a 8 team system. The points needed to make the playoffs with 8 teams was 48, compared to 46 points with 10 teams. That’s just 2 points different! While Portland and DC would have both been eliminated a game earlier in the season, conversely the New York-Philly game would have mattered a lot more to Philly – it’s a wash! The 10 team playoff format just doesn’t remarkably improve the regular season. An 8 team format would also simplify the playoffs and would allow the league to play two home and away series during the quarterfinals and the semis (conference finals). This would be a more equitable way of making the finals than simply having a one-off conference championships. It would also resemble the format used by the Champions League. Playing a second conference playoff game would also have a much higher profile game and would be much more profitable than the wild card games. Mathematically eliminated is not the same as “in the hunt” for the playoffs. Mathematically, San Jose and Chivas were not eliminated until about three games prior to season end. But no one in their right mind thought they were playoff bound. Same applies to DC, Chicago and Portland. If at 8 they would never have been in the playoff race come October. The league should also get rid of the western and eastern conference divisions. As every team plays each other during the regular season anyways, these divisions end up being arbitrary. Just have the top 8 teams playing in one bracket during the playoffs, with the #1 seed facing the #8 seed, and so on. It would avoid the unfair situation like this year, where the top four teams in the league (based on point totals) were all in the western conference.